A young elephant with oversized ears discovers he can fly and becomes the main attraction at a struggling circus. PG · 1h 52m · 2019. Colin Farrell · Danny DeVito · Eva Green · Michael Keaton. Ehren Kruger (screenplay) · Harold Pearl (novel) · Helen Aberson (novel). brief violence · mild threat. Disney continues to churn out their live-action remakes of their animated classics with new movie Dumbo. Based on the hour-long 1941 cartoon, it seems to make a lot more sense adapting this older film for newer audiences. But will it do as well as previous successes like The Jungle Book (2016) and Beauty and the Beast (2017). Certainly different is bringing in Tim Burton as director. Having a distinct visual style and a propensity for the whimsical, there's potential for him to bring something different to one of the studio's first features. 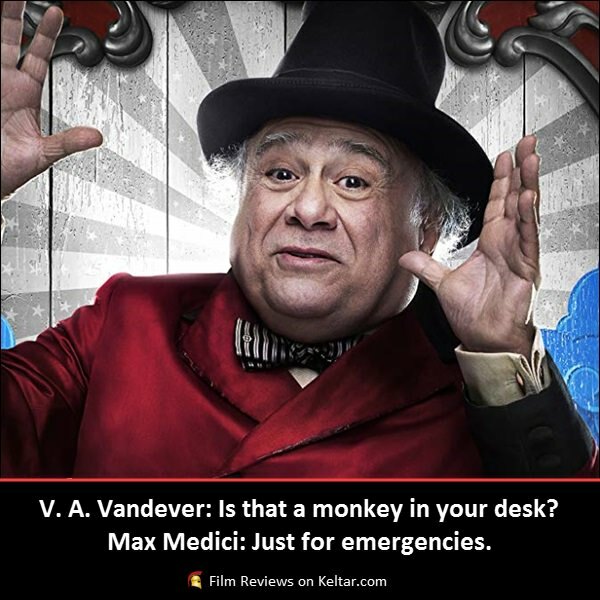 Set just after World War One, Danny DeVito's Ringmaster, Max Medici, battles to draw the crowds to his travelling circus. When one of his elephants give birth to a baby with unusually large ears, he hires veteran Holt Farrier (Colin Farrell) to look after him. Holt's children take a liking to the little elephant, who they name Dumbo. What they also find out is that he can use his enormous ears to fly, and unsurprisingly, becomes the circus' star attraction. It's not long before businessman Vandevere (Michael Keaton) comes along and buys Dumbo for his theme park Dreamland. Considering, the original Dumbo was very short and basic in plot, Burton has a lot more freedom to expand the story. Unlike the original, he focuses on the human characters just as much as the animal ones. This allows him to take the narrative in different directions and view the film through other perspectives. In that regard, this isn't a carbon-copy remake like some of the other live-action films, and can actually justify its existence. Burton is able to add more nuance and complexity for those older audience members, giving it a wider appeal. He does that by bringing a family element, with a father returning home from war trying to reconnect with his children. And Dumbo becoming an important element in mending this broken family. Despite those positive aspects, as a remake, the movie does struggle to soar. Or hit that emotional sweet spot Burton is so clearly aiming for. Far from bad, Dumbo does have merit but there are just a few too many issues that keep it from being anything other than mediocre. One of those issues being the slow pacing. For a film whose main target audience is young children, the story takes far too long to get going. Focusing primarily on the circus, Burton seems more interested in showing-off the social outcasts and performers. Likewise, he takes his time in getting Dumbo in the air. When we finally do get to the main plot of Vandevere and Eva Green's trapeze artist, we're already halfway into the movie. On top of that sluggish pace are the thinly written characters. Farrell's widowed war vet who finds it hard to talk to his children, the book-smart girl who no one takes seriously. These are familiar character types we've all seen numerous times before. Even Keaton's villainous theme park owner is pretty one-note. As good as the actors are, there's no attempt to add any depth to their characters. They all exist pretty much to serve the function of propelling Dumbo's journey. Saying that, Dumbo himself is super cute, excellently realised and will easily elicit the appropriate gushing feeling from younger viewers. Mixed with Danny Elfman's whimsical score, it has a very similar aesthetic to previous Burton films. Visually, there's a lot going on, and Burton presents a detailed world. Unfortunately, the only let down is the over-reliance on CGI and green screen. It worked a few years ago on Jungle Book, but here, it really does feel like everything was filmed in a studio. Thankfully, the movie is saved by a more exciting third act where the stakes are raised and the action moves at a faster momentum. As a remake, Dumbo is the logical choice when compared to some of the other live-action Disney films. Emphasising that human component, Burton gets to explore this familiar story in a fresh new way. Bringing his unique visual style, it feels and looks different to its predecessor. What hinders it sadly is a sluggish pace with a boring first half, and is only partially redeemed by that thrilling last act. With Renaissance remakes Aladdin and The Lion King still to come out this year, Burton's movie is likely to fall at the wayside, being the more forgettable one of the three. David has quite a broad taste in film which includes big budget blockbusters and small indie films; including International and Arthouse cinema. As long as it’s good in that particular genre, he’ll watch anything. 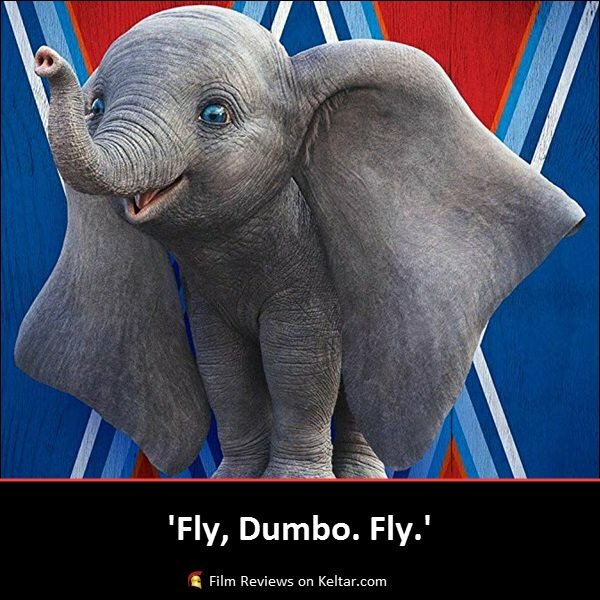 Dumbo is a young elephant with oversized ears, who discovers he can fly and becomes the main attraction at a struggling circus. This article is copyright owned by Keltar Limited. All rights reserved. Plagiarism or unauthorised copying is not permitted. All other copyrights remain the property of their respective owners. Posters, images and quotes credit: Dumbo (2019) production and distribution companies. Trailer credit: Walt Disney Studios – YouTube]. Art, books, films, shows, people and projects.